75 years to the day that Mallard achieved the world record for steam traction, six A4's will appear around the turntable at York Railway Museum. 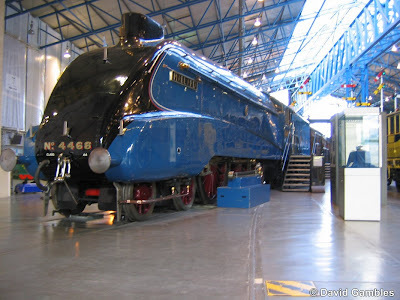 Between the 3rd and 17th July 2013 the six locos will be displayed together to celebrate Mallard's record breaking run when it reached 126 mph on Stoke Bank. The public will be able to visit the museum free of charge to see the engines posed around the turntable. Other events are planned in 2013 to celebrate the 75th anniversary include an Autumn Great Gathering 26th October to 8th November 2013, Locos in a Different Light 30th October to 2nd November 2013. Visiting locomotives Dominion of Canada and Dwight D. Eisenhower are on loan until 2014 at which time they will return to their respective homes in Canada and the USA. In February 2014 prior to their return, a display of all six locos is planned at Shildon, between 15th and 23rd, giving one last chance to see the locos together, possibly in our lifetime.